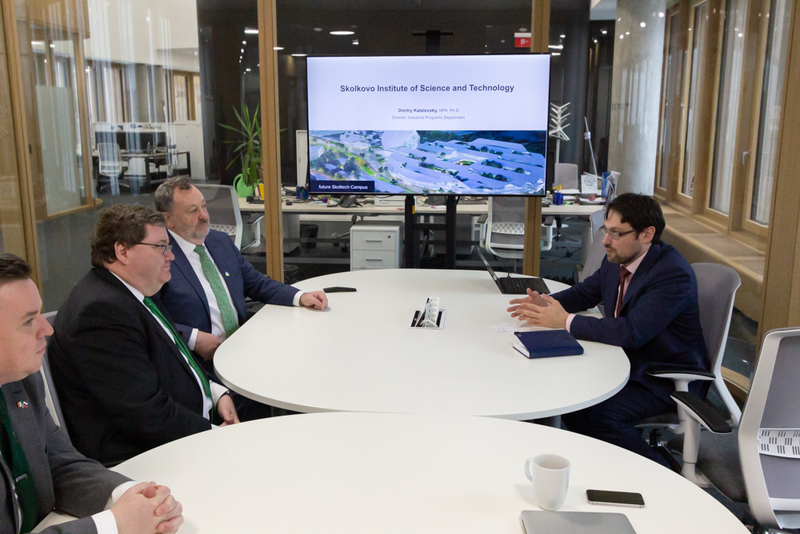 On Saturday, March 16, Skoltech’s Dmitry Katalevsky, of the Department of Industrial Programs, and Olga Grigorieva, Project Manager, met with Ambassador of Ireland to Russia, His Excellency Adrian McDaid, Speaker of the Senate, Senator Denis O’Donovan, and Deputy Head of Mission, Frank Power. The purpose of the visit was to discuss the continued partnership between Skoltech and Irish companies (Irish Cattle Breeding Federation, Sustainable Food Systems Ireland, Teagasc) on the development of a livestock genetics database in Tatarstan. This pilot project, “Development of scientifically based concept of dairy cattle breeding at the republican level of the genetic resources management in Tatarstan”, is the first of its kind in Russia. It aims to increase the amount of genetic data available for cattle breeders (other partners include the Federal Science Center for Animal Husbandry named after L.K. Ernst, Kazan State Veterinary Academy after N.E. Bauman, and the State Breeding Enterprise “Elita”). The project is based upon a system that is already established nationwide in Ireland and brings together Skoltech specialists and Irish specialists in partnership. Although the project is only a year old, it has already drawn serious interest from the Tatarstan senior government and some within the Russian cattle breeding industry. It is expected that the project will achieve visible results in 3-4 years, which equates to the same time-frame within which the Irish genetics database was implemented. The idea is that if Ireland could make a technological leap within such a short time-frame, then Tatarstan serves as the ideal starting point for Russia, as it is roughly the same size as Ireland. A genetics database provides the necessary information for precise selection of certain traits in animals and facilitates the use of artificial insemination (AI), a cheaper and more efficient tool for increasing the number of livestock than traditional methods. It allows breeders to predict accurately the milk and meat quality/quantity, as well as traits in the livestock itself. This has served as a key method to improve the quality of milk in Ireland, where farmers receive money based upon the milk solids content (fat, protein), not the total volume. With this in mind, such a database would be of immense benefit to the Russian dairy and meat sectors. Both sides agreed that a long-term project such as this is a means to maintain and build personal relationships, a factor that is also a key to success. Both also emphasized the importance of expanding and promoting research in agro-technology if a country is to succeed in modern food production. Ireland is a country of 4.5 million people, but produces food to feed 35 million people; this is in major part the result of its adoption of modern agro-technologies. The partnership between Skoltech and Irish agri-specialists is set to continue for the near future and is expected to see many positive achievements in the coming years.